pests and it ultimately affects the crop yield leading in economic loss to the farmers.. It was observed that the farmers were only applying chemical pesticides to control these sucking pests and they were seeking the advice only from the pesticide dealers. Even though the farmers were applying costly chemicals on okra crop, they could not satisfactorily control these sucking pests besides increasing the cost of production. With the introduction of the KVK in this block, the problem was identified and discussion were held with the vegetable growers in Ambi and Dawangaon villages. The effective solution in the form of yellow sticky traps was advised for the management of these sucking pests as well as to minimize the cost of plant protection. The farmers were asked to install 20 sticky traps per acre 21 days after sowing of the okra crop. These sticky traps help in attracting the sucking pests and thereby killing them by sticking on these traps. The KVK undertook an assessment on effectiveness of yellow sticky traps against sucking pests at 16 different locations in Ambi and Dawangaon villages. Initially large number of jassids and white flies found attracted and stuck on these traps and during the next month thrips were also attracted towards these traps and got killed by sticking on them. By observing the killed pests on these traps the okra growers got fully convinced and they found that almost 50% chemical sprays were minimized. It was also observed that the infestation of jassids and white flies was managed upto 80% which was only 40-45% in chemically treated plots. The farmers started to approach the KVK for supply of these traps to install in other crops like cotton, vegetables, grapes, pomegranate etc. and the technology also spread in the neighboring villages. For large scale adoption of sticky traps in all .important crop the technology was popularized through mass media like radio talk and news paper articles. 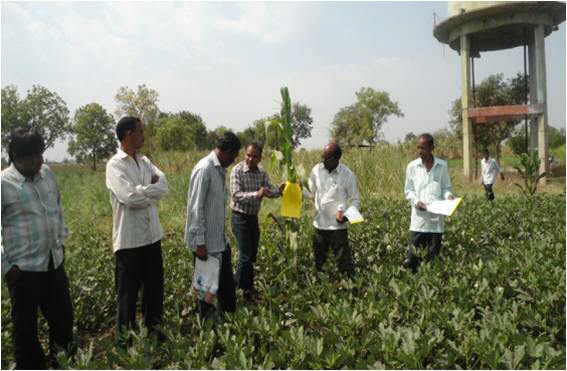 It was noticed the farmers could save 60% cost on plant protection besides proper management of sucking pests in okra crop. By observing the results some of the farmers purchased more number of traps and installed in their fields. By considering the demand for sticky traps from the farmers the KVK started to supply the sticky traps to the farmers through the service center of the KVK. Thus the supply of inputs at the proper time has also resulted in increasing the adoption of this technology. The okra are fully convinced about the results of sticky traps and also gave the feedback that the per acre number of sticky traps should be increased for getting total control of sucking pests not only in okra but also in other important crops..